Do you teach guided drawing to your students? Cassie thinks she has found just the right balance between those strategies and a more open-ended emphasis. 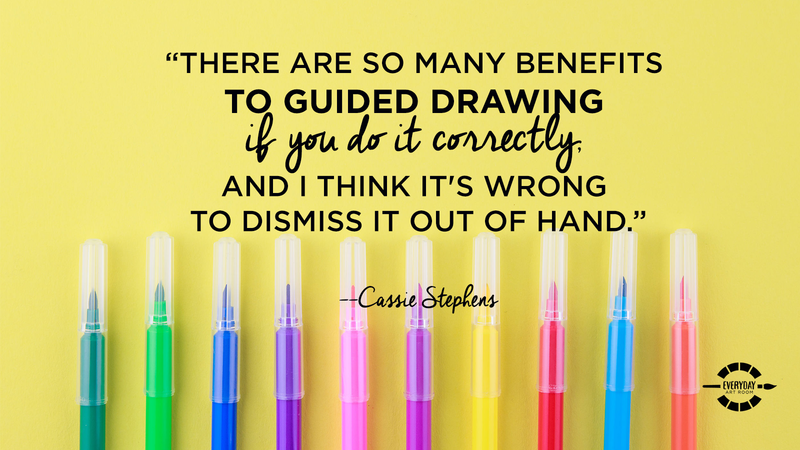 Cassie goes through the pros and cons of guided drawing, how she incorporates individuality and creativity in the guided drawing experience, and how to make that experience stress-free for her students. Full episode transcript below. Cassie: I have noticed that there are certain things in art education, maybe it’s just elementary art education, I don’t know, but there are certain things in art education where I feel as though we’re kind of pressured to pick a side. For example, you’re either TAB, teaching for artistic behavior, or non-TAB. You’re either choice-based or non-choice-based. You’re either project-based or non-project-based, and I cannot tell you how much I hate that. I hate the idea that we, as art teachers, as creatives, are trying to paint ourselves into a corner, so to speak. In a way, saying that you have to pick a side, pick a team, and then you’ve got to stick and play by all the rules of that particular playbook. You better not even think about venturing outside of that little corner you painted yourself in, because if you do, then you’re no longer a part of our team. That drives me bananas. That’s one of my biggest pet peeves about art education. I don’t know where that trend started, but I’m challenging me and all of y’all to kind of debunk that and break that. And one thing, one method of teaching that I oftentimes feel gets a bad rap from all sides of art education is guided drawing. Some people hate it. They feel like it kind of pigeonholes kids. Other people think that it’s just a way for kids … throw-away art time, so to speak. Personally, I love me some guided drawing, and so do my students. I’m going to share with you the pros and the cons, and now how I’ve worked around those cons to really make guided drawing work for my students in my art room. And maybe, you know, you’ll want to give it a shot too. This is Cassie Stephens, and this is Everyday Art Room. So I first became familiar with guided drawing my very first year of teaching. I don’t know that I called it guided drawing or that’s what it was called back then. All I remembered was that my first year teaching I was in my portable trailer, detached from the school, without a clue as to what I was doing, and all I had were these three-ring binders filled with lessons that were just a little bit too wide open for a teacher who really needed to have her hand held. I mean, as a first-year teacher, I didn’t have a clue. As a 20th-year a teacher, I still don’t have a clue, but back then it was a lot more difficult for me, and I remember going to the library constantly just scouring for books. One book that I came across that I know I’ve shared with you many times before was Drawing with Children by Mona Brookes. It really opened my eyes because suddenly, in the pages of this book, I could see all of the possibilities of what children could do and what they could create. It was more than just giving them a piece of paper and telling them to draw. It was showing them how to draw, the steps to be successful at drawing. Just looking through the book, I thought, “This isn’t possible. How could I possibly get my students to the same level?” And just kind of going through the book and just seeing how she broke everything down step by step, I thought maybe this is something I could try in my classroom. And when I did, I was successful in teaching. My students were successful in their creations. They were really proud of their work, and I was really excited. So that’s kind of how I was introduced to guided drawing. Now, 20 years later, it’s a tool in my toolbox of art teachering methods. I don’t use it a lot, but I do use it, and so I want to talk about the cons that I’ve heard about guided drawing, the things that I’ve heard people say that is the reason for steering clear of it, and then I’m going to debunk those cons. At least, why I think they’re nonsense. That’s nonsense. I’m going to debunk it. At least, debunk it for my world. So the first con that I sometimes hear about guided drawing is that it’s too restricted, too restrictive, and it puts too much-unwanted pressure on a kid or a young artist to kind of achieve this gold standard. Another con that I’ve heard is that it shows students that there’s only one way to draw, that if you don’t draw something in this very strict and formulaic way, then it’s not going to be correct. And the other thing that I’ve heard is that it doesn’t allow for creativity. There’s no wiggle room. Okay, so here is how I’m going to debunk those cons, because I believe there’s some truth to them, especially if you don’t teach guided drawing correctly, or if you do teach it in too restrictive of a manner, or you are putting too much pressure on your students. So here’s how I get around those kind of negative feelings, because I never want that to be my students’ experience in the art room. So the one thing that I do before we ever venture into a guided drawing project, which, like I said, that’s just a tool in my toolbox. It’s not the only method of creating in my room, definitely not the only method. It’s just one of many. One of them is, is I always tell my students this at the very beginning before we draw: we are going to draw together. We are going to be hearing the same set of directions together, but because we are all different and because we are all unique artists, even though we’re all going to hear the same thing, the way our imagination and our creativity takes what we hear and puts it on that paper, it’s all going to be different and unique. So whatever I am drawing, I don’t want that same thing to appear on your paper because you are a different artist than me. If I had wanted the very same thing, well, then I would have just gone and made copies of it. I really encourage my students to embrace those mistakes, those “mistakes”, because that’s what they’ll call them when they see something that looks different than what you have drawn. A great book maybe to share with them before you do a guided drawing experience, something that we read at the beginning of each year, is a Beautiful Oops!, and that’s what we refer to a drawing or a little line or a smudge that they might not have wanted, and it doesn’t quite match what I’m drawing, but hey, it’s a beautiful oops. How can I now take that and make this a part of my own unique drawing? Another way that I’ve gotten around having my students feel unwanted pressure is this. I call these drawings, whenever we do a guided drawing together, I call them our practice drawings and just saying, “Hey. This is just a sketch. This is just a practice drawing. If you are not happy with it, next art class, when you come in, that paper, that drawing you made, that will be your guide, and you can try it again,” and that immediately just kind of lets their shoulders release, puts their mind at ease, and lets them know that they don’t have to put a lot of pressure on themselves as they’re drawing. 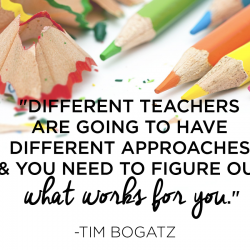 And what I’ve noticed is, is that my students will sometimes get hung up on … Especially my older kids … one tiny little thing, and if I just say, “Relax. It’s a practice drawing. Next time you come in, you can do a brand new one,” 99% of the time when they come back to art class, they’ve completely forgotten whatever little line or “mistake” that they’ve made and they’re happy with their drawing. But if they’re not, then, of course, I give them that option. I also have found that dry erase boards are great … Especially with my older kids. It’s always my older students, I have found, that put more pressure on themselves. My younger friends, my kindergarten and first, and sometimes even my second graders, they are just having a blast, being excited that they’re actually drawing something that they’re recognizing and they’re able to follow along with their friends and with me. My older students, and you know, you middle school teachers out there, you definitely know this. They put so much pressure on themselves. So if you let them draw along with you with a dry erase board, then they can fix the little things they’re not happy with as they go, and then take that dry erase board with them back to their seat as they follow along with their own drawing and recreate it on a piece of paper. So those are kind of some little stress relievers I’ve also added, and when my students draw, when we’re drawing on paper, we either use sharpies or we use pencils without erasers. Otherwise, you’re going to have students who are constantly erasing. And again, if they’re saying, “Well, I need an eraser,” just remind them, “No, you don’t. Flip your paper over if you feel like it, but keep in mind, this is just your practice drawing,” and that really does help them relax. Now, another thing to do … or another reason I love guided drawing is that I can introduce so much vocabulary, and also show the application of that vocabulary. So if I’m talking to my students about lines and shapes, especially my younger friends, I can use those words when we’re drawing. All right, we’re going to find the middle of our paper. We are going to draw a vertical line. Suddenly, not only are they hearing the word, but they’re seeing it and they’re also drawing it. Now we are going to make a parallel line. So this is why I find guided drawing to be so great, because I can share with my students the application of the vocabulary we’ve been learning. It’s also wonderful for ESL kids. I have a high population of ESL friends, and so it’s awesome for them to see, hear, and do those vocabulary words. What this does is it prevents your kids from trying to guess the next step and then perhaps not drawing what you’d had in mind, or not going the direction that you had planned on taking them, and it also means they’re going to pay closer attention to what you just drew and then have greater success when they try to draw it on their paper. And then their signal to me when they’re finished drawing is they have to put their pencil down. When I see all pencils down, I know I can pick mine up and show the next step. And when I’m introducing that to the kids at the beginning of our drawing, we play a little game and I will say, “Okay, whenever you see my hand touching my pencil or picking it up, you have to put yours down.” So I’ll pick mine up. They put theirs down. I’ll pretend I’m about to put mine down. They start to pick theirs up and I’m like, “Ah, I gotcha.” So it’s a fun little thing to do right at the start so they understand pencils down, and what that will mean is that you will have more attention and eyes on you. Not only is guided drawing a great way to introduce vocab and the application of vocabulary, but it’s also super amazing for sharing with students the elements of art. Look, we’re using lines. Now those lines are connecting, creating shapes. Here’s how we can create pattern, texture, form, and space, all of these things as you’re pouring these words into their head. You’re showing them, look, we’re using those magical ingredients of art to create our work of art. I also think it’s a really good way for students to understand how to go about drawing. I remember being a kid, and I had this How to Draw book, and it was How to Draw Dogs. I loved dogs growing up. And it’s kind of like that funny cartoon that I’ve seen floating around Facebook where it’s like how to draw something extremely complicated, like a running horse, and it shows like draw two lines, draw two circles, and boom. The next thing you know, the next page is this amazingly beautiful, realistically shaded, galloping horse, and that’s kind of how this How to Draw Dogs book was for me as a kid. A couple of lines, a couple of shapes, and next thing you know, it’s like the most epic dog drawing ever, and I just, I love to look at the book, but I could never make it happen for me. I could never make that connection. And I think a lot of my, and probably yours, young artists struggle with that. Some kids, it just comes naturally. They can see those lines, they can turn them into shapes, they can create them into something realistic, but most people need to be shown how that works to actually make that happen. So I think when you are doing guided drawing with your students, it’s a great way to segue into showing them how you can use these steps, how you can break down something that you’re trying to draw, into simple lines and shapes and textures and value to create whatever it is you’re trying to draw. So sometimes when you take a simple guided drawing, you can then go onto something like observational drawing, and allowing them to see those lines and shapes, and then moving on to even more difficult things. So that’s one of the other reasons that I love guided drawings. You’re guiding them through that experience of being able to use the elements of art to create their work of art. And when you do that … Gosh, if you’ve ever done guided drawing with your kids, then you know the confidence that they have. Just the sense of pride. They suddenly are like, “Oh, my goodness, I am an artist,” and it might be something that they’ve never felt. They’ve never had that amazing connection with their drawing before to realize, wow, I really can use a pencil and paper and make something look realistic, make something look like a recognizable object or a thing or a cartoon character. Of course, to do this, some of my favorite resources, How to Draw books. I just don’t recommend that one particular How to Draw a Dog book, if you know the one I’m referring to, but there are some amazing books out there. But sometimes I really think that after doing a guided drawing, it helps to then show the kids those How to Draw books so that they understand, look, the How to Draw book is doing the very same thing. It’s breaking it down into simple steps to show you the lines and shapes to create a drawing. A lot of times when my students will use How to Draw books if we haven’t talked about how to go about using that book, it’s just like how I felt when I was a kid. It’s just too much information. They don’t understand how it’s broken down. It’s part of our job to show them how that works so they can be successful with that. Of course, I love showing videos. Though I love showing the ones that I’ve made where I’ve done some guided drawings with my kids, but Art Hub for Kids is hands down probably the best, at least according to my students, guided drawing videos to share in the art room. If ever you’re having a day where … or if you have a sub or a day where maybe kids are finishing projects up, or you have a shortened half day and you need a quick lesson, I would really recommend throwing that kind of experience at them because Art Hub for Kids and other How to Draw videos, it’s a great way for them to be drawing on their own at home. Of course, I love to use just regular books as inspiration. One of my favorite activities to do is to read Don’t Let The Pigeon Drive The Bus! I do this every year with my kindergartners doing Read Across America Week because, of course, you know your girl has a dress for it. I have a Don’t Let The Pigeon Drive The Bus! dress. I wear that, I read the book, and then we use lines and shapes to create our very own pigeon, and that I know for certain is a video on my YouTube channel, and it’s something where all of my students are super stoked and excited. And of course, more recently, when I dressed as ROY G BIV, I had my students, kindergarten on up through second, all draw a portrait of ROY G BIV, which was a lot of fun because then it just kind of not only boosts their confidence with drawing, but it just reminded them of why we’re learning ROY G BIV and the order of the colors of the rainbow. So that’s why I’m just a fan of guided drawing. As I said, we do all sorts of different kinds of projects in my room, open-ended projects, projects where I kind of have an idea of what the artwork will look like at the end, and sometimes I don’t, more open-ended projects. We have days in my art room where it’s open choice, free choice in the art room, and other days when we’re going to be following along with me. And I feel like giving your students a really well-rounded art experience, not just all of one or all of the other, because teaching, in general, is not black and white, but there are so many different colors of the teachering rainbow, especially the art teachering rainbow, that I feel like we would be doing our students a real disservice if we didn’t share all aspects, or as much as we can, with our students. Guided drawing, I feel like, is one of those great teaching tools that we could all use in our art room. Tim: Hello, this is Tim Bogatz from Art Ed Radio. Just a quick reminder that you can find all things related to Everyday Art Room on the Art of Ed website under the podcasts tab. 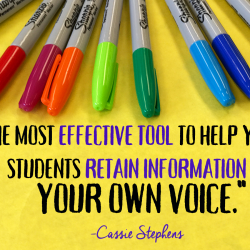 You will find the full transcript of every show, links to Cassie’s blog, AOE articles, and other resources that can help your teaching. 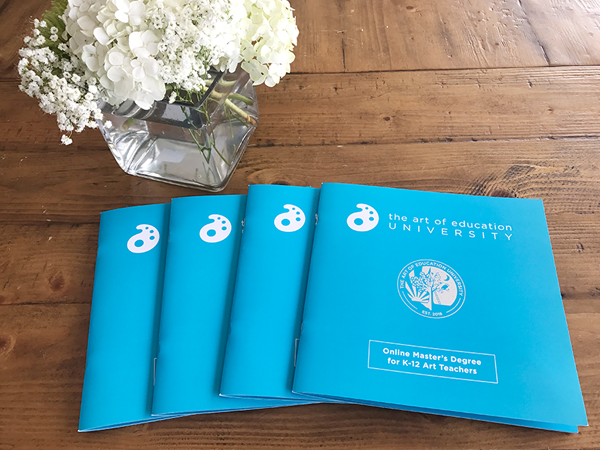 It’s all at theartofed.com under the podcast tab. You can also sign up to receive weekly emails whenever a new episode is released. Now let’s get you back to Cassie as she opens up the mailbag. So when I had them in my room the next day, we had a little bit of a chat about that, because I really wanted … I don’t want them to just have good craftsmanship in my room. I want them to have good craftsmanship and a sense of pride, period, always. And it’s funny. So we started talking about that in my room, and I said, “Well, why do you guys do that? Why do you try a little harder in here as opposed to everywhere else?” And they said, “Well, because we know that you won’t accept it and you’ll have us redo it,” and then one of my students, my genius little kiddos said, “And if we have to redo it, well, then we’re just using more time anyway, so we should just do it right the first time, even if it takes us longer.” Slow clap. And it was then that I said, “Oh, my goodness, you’re so right,” and then we had a big long chat about that, about doing it right, giving it your all, doing your very best the first time. 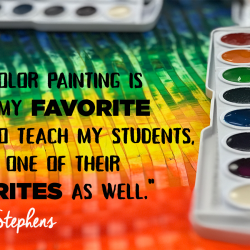 Then you’re going to have a work of art that you’re proud of, and your mean and rotten art teacher, AKA Ms. Stephens, isn’t going to have you go back, erase, redo because she knows that you have the potential for great, great things. And that’s what I tell them all the time. I know what a great artist you are. You might not know it, you might not believe it, but I know, and so I’m going to hold you accountable for that. I have no qualms whatsoever with having kids go back and redo. I don’t buy into that, “Well, I want it that way,” all that much. I mean, if I genuinely believe it, but you guys can smell a rat. You know when your kids are just pulling your leg, trying to get out of it. Especially in my room, we have some really fun early finisher stations. If my kids are really champing at the bit to go to those early finisher stations, you better believe I shut those down real quick when I see kiddos rushing through artwork to go do something like that. That’s a great question. One I think that all of us would love to know a little bit more about, so thank you for that one. My next question is this. These are from Instagram, by the way. I recently threw out there on the Instagrams if y’all had a question for me, and I got a huge amount of questions back so I thought I would share with you a couple of those questions and those responses, and this question is: I’m studying to become an art teacher. Anything I should know ahead of time? I’m going to give you my list. Number one, start loving the taste of cold coffee. You’re not going to like intentionally go out and get cold coffee, but by the time you pour yourself a cup of coffee and then go about prepping supplies, pouring paint, cutting paper, and then you finally relocate that coffee, it’s going to be cold as ice, and that’s probably all you’re going to get for the rest of the day, so you might as well enjoy it. Number two, start loving the taste of a cold, half-eaten, paint-stained burrito. For some reason, in my room, I have 30 minutes for lunch, and then I have back-to-back classes. I don’t have no time to be sitting down in the teacher’s lounge waiting in that line to microwave my food, and then enjoy it, and then run back down to my room. That’s just not something that exists in my art teachering world, so my favorite meal is a burrito. I think they are like the best invention ever. I can walk around with it, get stuff ready. The problem is, is that sometimes there’s paint on my hands or I mis-locate. Is that a thing? I dislocate, I know I don’t dislocate my burrito. I don’t know where I placed it, only to have students find it later. I never eat it once they’ve brought it up to me. That’s disgusting. Start loving having paint and mysterious objects and things under your nails. You’re never going to want to pay money for a manicure because your nails, and whatever mysterious items that you have underneath them, they’re always going to look shabby-chic. Only in the summer are you going to have nails that you’re going to be proud of. And last but not least, get ready for the most thrilling, exhausting, emotional roller coaster of a job there ever was, and enjoy every minute of it, especially your first year teaching. You are going to learn so stinking much. If you have a question for me, feel free to send them my way. You can find me at the Everyday Art Room at theartofed.com. So do you want to know who the father of guided drawing was? Well, okay, so it wasn’t guided drawing, but guided painting. Did I give you a little bit of a hint? If you’re thinking Bob Ross, you’re close, but it was actually a gentleman named Bill Alexander, and I know this because every Sunday my dad and I would watch Bill Alexander paint, and he was a lot like Bob Ross. He came before him, and he did the exact same thing, but just without that finesse, that magic that Bob had, but it was the same premise. Follow along with me, paint with me, and you’ll end up with a magical masterpiece just like me. Well, my dad bought into it, hook, line, and sinker, and bought the kit. And my dad is actually very artistic, but because he tried so hard to follow along so closely, he was just never happy with his paintings or successful at it, and I remember they eventually, just all of the canvases and the palette knives and the smelly oil paints, all ended up in our basement. But it’s funny to me to think back on that, and how could anybody think anything negative of our main fuzzy-haired squeeze, Bob Ross? If Bob Ross is going to do guided painting, then by golly, I’m going to do some guided drawing in my art room. Thanks, guys. I hope you have a fantastic week.